This year I’ve kept very careful track of the time I spent volunteering at Maryland State Golf Association events and meetings. Given that we have one main event left (our annual meeting in a couple of weeks) I thought I’d total up my time. Wow. Starting in March I officiated at 22 events on 18 different courses around the state. I spent a total of 385 hours on course, not including travel time to and from home. I arrived at the course at 6:45AM on average (5:45AM was the earliest) and averaged leaving the course at 6:10PM. All told I spent 385 hours on various courses. I drove 1975 miles to get to and from the events. The longest round trip was 350 miles (Williamsburg) and the shortest was several events at Columbia, just up the street in Chevy Chase. By the time the annual meeting is over I will have attended 34 hours of Board and other meetings, spread out over 8 events. I will have driven 540 miles to and from those meetings. So here’s how all that adds up: 48 days, 419 hours, 2515 miles. Out of pocket costs other than gas: $155. Gas cost (est): $300. Oh. And I loved every minute. For those of you who think that nothing’s being done about pace of play, I refer you to this post. Long live checkpoints! Now if we can only get the system into the US Open, the US Women’s Open and the US Senior Open I’d be even happier. I’ve been fortunate to learn about two wonderful acts of sportsmanship on the golf course this year. What makes them worth thinking about is that they both happened at the highest levels of amateur golf a month apart. While I’d like to think that this sort of thing happens often, I wonder if it actually does. 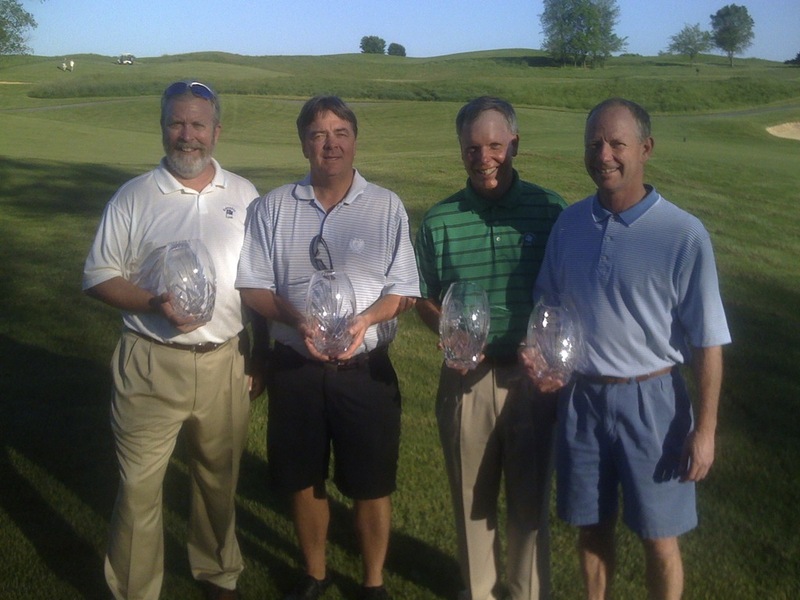 The first event was in early June and had to do with the scheduling of the finals of the Maryland Amateur. The weather was atrocious all week and the finals had to be rescheduled from Sunday until Monday. That didn’t become an issue until the second finalist was determined; he was scheduled to play in the second stage of qualifying for the US Open on that same day. After much discussion and soul searching (and no pressure from either officials or the finalist with the issue) the other finalist decided that if the situation were reversed he wouldn’t want to have to choose between attempting to qualify for the national championship and potentially winning the state amateur. So he agreed to postpone the final until Tuesday so his opponent could attempt to qualify. The second act of sportsmanship happened yesterday. Two friends (of mine and of each other) were playing in the 36 hole final of their club championship. They are both outstanding players; one is a nationally ranked amateur and the other is highly acclaimed in our region. They came to the 34th green all square and both had makeable birdie putts. The first player missed his putt. The second player conceded his next putt and attempted to knock his ball back to him. Instead, the ball went in the hole. The second player then proceeded to make his birdie putt, ostensibly taking a one-up lead going to the 35th hole. At that point the referee, who is also the head professional at their club, stepped in and erroneously ruled that the second player, by inadvertently knocking his opponent’s ball into the hole, had made a practice putt and therefore had lost the hole. Both players were stunned by the ruling and attempted to make the case that it was not in any way a practice putt. The head pro would have none of it and apparently didn’t try to look up whether he’d ruled correctly or not. The player who’d lost the hole on the course but won it by incorrect penalty then conceded the 35th hole and they walked to the 36th tee all square. That was about all he could do as he was powerless to change the wacko ruling. It doesn’t change the value of the sporting acts, but neither outcome could be deemed a fairy tale ending. In the case of the Maryland Amateur the accommodating sportsman lost on the 36th hole of the final. He took the loss very hard, but he’s an outstanding player with many years of fine golf ahead of him. As to the club championship case, it was every bit as outstanding match as the first 33 holes were. The players both made par on hole 36 and birdie on the 37th. The player who conceded the 35th hole then made a birdie on the 38th to take the championship. There’s one other aspect of the latter situation that I can’t get out of my mind. If it’d been me who’d had that ridiculous ruling on the 34th green I’m not at all sure that I’d have been able to make a swing afterward. Maybe that’s why he’s a fabulous player and I’m not. Good on you, my friend. Over the winter a friend and I were batting around ideas for the cover story of our club’s annual golf magazine. Since the club is hosting the diamond jubilee of the Frank Emmet Schoolboy this summer we decided that Mr. Emmet, now gone for more than 25 years, would be an ideal subject, especially given the club’s long history with junior golf and with Mr. Emmet and the Junior Golfers of Washington in particular. I volunteered to start the research and to write the piece if we couldn’t find a more talented author. Mr. Emmet was a fascinating character, revered among those who oversee junior golf programs. He lived a modest life in the suburbs, worked hard as a salesman for a paper and printing company, and worked even harder at volunteer wages to make sure that ‘his boys’ learned the lessons golf teaches, primarily those of honor, responsibility and sportsmanship. He was a stickler for the rules of golf and for appropriate behavior. He’s frequently and appropriately referred to, even today, as ‘the father of junior golf’ in America. Tens of thousands of boys played in his tournaments in the 55 years he operated the Junior Golfers of Washington and millions of boys and girls have participated in programs around the country modeled on what Mr. Emmet built here. When Mr. Emmet retired from the JGW the board created a scholarship fund for participants. Each year the fund holds a fundraising tournament at a local course and most of the clubs, especially the old line ones, send a team to compete. I’ve been fortunate to play in these outings before but never came close to even a net prize. Until this year, when my friend who’d proposed the story idea suggested that we play together and bring along the golf and green committee chairmen to fill out the foursome. It sounded like a great idea and I looked forward to it. Then I hurt my shoulder, then reinjured it. Couldn’t even practice – much less play – for 2 months, and even then I could only putt. It gradually started to feel better (thanks, Rick) a couple of weeks ago and I was able to hit balls full speed. The last hurdle was deep, thick rough and I tried that out 10 days ago. No pain, no problem, let’s go. But I still hadn’t had a chance to play a single hole since before the hurting myself again in February. So yesterday rolled around, it’s the tournament named for the guy I’d researched and written about, and it’s my first round of the year. My expectations were low and I figured that my main contribution would be to be sociable and supportive of my teammates. Now, I can’t say I made the most birdies or hit all the straight drives, but I made a putt here and there and made some timely pars. And we won the event. Not a major, just a fun little competition with good pals and among friendly clubs for a good cause. But a few of us did wonder if there was some cosmic tie between our performance and the article or our hosting Mr. Emmet’s tournament this summer. OK, this is one for the books. Caps are on a roll (having dispatched the Pens after TCB with the Rangers) and eveyone on the train home Saturday afternoon was in a great mood. 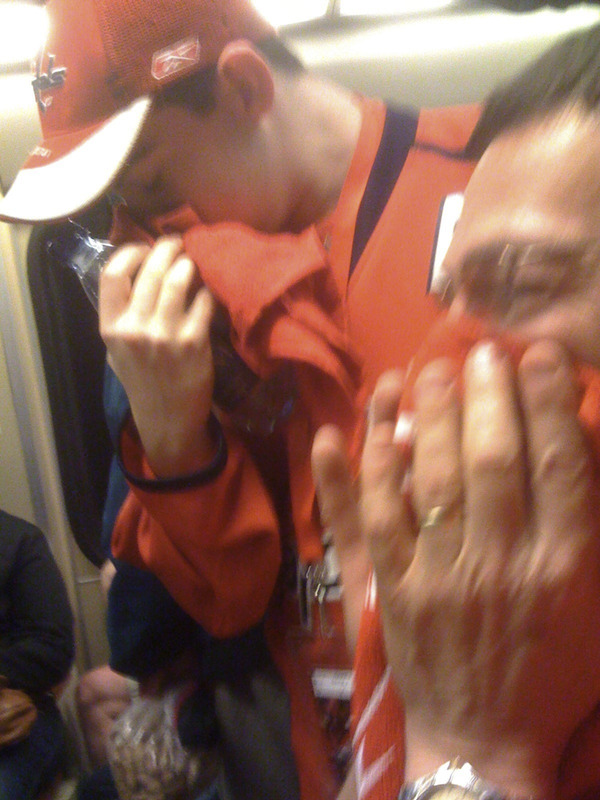 Then these two – father and son, apparently – pushed into the train, which brightened the mood even more. The kid finally gave up when he finally realized that most of the rest of the car was highly amused by their frivolity, but the dad kept up his PDBR (public display of brain rot) for at least a half dozen more stops. Mercy. Somebody shoulda sneezed. Hockey makes me cry. My eyes well up and I choke back my emotions because after all, who cries at the start (or finish) of a hockey game? It’s a hockey game, for Pete’s sake. Big guys on skates slamming around with sticks at 20 MPH , crashing into each other and trying to shove/slap/pound a frozen hard rubber disk past a guy wearing 40 pounds of padding. A tough guy’s person’s game if ever there was one. But standing in the Verizon Center, Caps hat over my heart, every anthem throws me suddenly back to 2001. Oddly enough, looking back at those uncertain and horrible days after the throwbacks from the Dark Ages crashed those planes into us, I was happier. I landed in Gothenburg about 10AM local time on September 11, 2001, there to prepare for a meeting I was organizing/hosting/chairing a month later. As usual, I checked into the hotel after the all night flight and went to sleep for a couple of hours. Woke up to Aaron Brown standing on a rooftop with smoke pouring out of a hole in one of the towers behind him. My jet lagged brain thought he said that a plane had crashed into the building. Then the second plane hit while he was talking. He didn’t see it because he was facing the camera. But the rest of us saw it. And felt it, even across oceans. Our kids were both in school in the District and the rumors started to circulate. CNN, having airtime to fill, started airing them. “Fires on the Mall. Plane headed toward the Capitol. A helicopter has crashed into the Pentagon.” Great. The country’s under attack and everybody I love is in Washington, and I’m stuck thousands of miles away across an ocean. My jet lagged brain then tried to direct Gigi to the best routes to take, and the ones to avoid, to get downtown and pick up the kids. Trying to take charge from Sweden seemed like a good idea; it sounded ludicrous in Washington. She and a friend drove down, picked up everybody’s kids, and returned to what seemed like the relative safety of the suburbs. I mean, even my jet lagged brain figured that the 7-11 on MacArthur Boulevard was an unlikely target. With all flights to home grounded there was no chance to get back. I did manage to make it to England where good friends took me in for as long as I needed; that turned out to be a week. We made lemonade by touring a different corner of East Anglia every day. Pubs, churches, ruins, villages, followed by more pubs, villages, and narrow, hilly, winding, rain slick lanes better suited to carts than sedans. John’s driving so terrified me that I almost forgot why I was there. Joan, having survived as John’s passenger for 40 years, took refuge in the back seat and had a quiet bit of fun noticing my white knuckles. One day we didn’t go touring. The memorial service from St. Paul’s was on the BBC. The orchestra played our National Anthem, God Save The Queen, and an entire program of tear-inducing music. I stood in the doorway of their parlor, hoping that if I didn’t go in and sit down I’d somehow avoid the tears. That didn’t work; I cried my eyes out missing the family and being glad they’re safe and being sorry I can’t be there for them and for me. Later, after I calmed down, I made a joke about the size of the upcoming cellular bill. I was flying so much that I was in United’s top tier of frequent flyers, which came in handy. We had a private number in most every country to call for customer service, and I called it twice each day for news of flights. They were amazingly patient and never once got cross, as the Brits say, and they managed to get me on a flight on the first day they were allowed to fly. Even better, it was the first flight from Heathrow to Dulles. Upper deck of a 747. Everybody was nervous and eying everybody else, especially the middle Eastern looking guy sitting across the aisle and one row back. Trying to be non-obvious about the obvious while begging the crew to do something, anything. Like get him the hell off the plane. Security finally came on board and so very politely asked him to join them back in the terminal. After an hour he was back, apparently absolved of Flying While Arab. The crew later confided that they’d had his bags pulled off and re-re-re-examined, too. Got home to what passed for normalcy. At the Caps games that fall, images of waving flags and wheat fields filled the scoreboard and signs around arena during anthem. Everybody sang like they really meant it, something I hadn’t ever heard before. Frankly, I don’t know how the performers got through the song without choking up. The whole place was wrapped up with so much pride and anger and fear all rolled into 2 ½ minutes of song. Then huge cheers at the end, and much more than the ‘OK the song’s over, let’s play’ cheers. Every single night. Now, I’ve been in the same arena for 40+ games, listening to the same song, watching similar images. And the memories come. Every night. or, The Islands in Spring Valley, mon. Or ‘Summertime in veddy, veddy, upper, upper northwest, dahling’, if you prefer. me: pressed for time and feeling like I’d like to be invisible buying my frozen pizza and $12 Pinot. Feel better immediately when I arrive at the express line behind a woman with a six pack of red stripe and a hunk of Edam. Basic food groups covered, and neither one of us has a People or Us Weekly. cashier: asks her if Red Stripe is good. His accent betrays his Jamaican heritage, at least to my ear. she: says yes, it’s her favorite. She used to teach elementary school outside Kingston, nice smile, starts to leave. Not sure if there was bait in the water, but she’s not taking it regardless. Not spurning, just swimming past. I recall that the first time I heard it was at MCI Mail, which would put the timing sometime in the mid-80s. It was in exactly the context I described above. An engineer was asking a product manager to get a little bit more realistic about a particular product design. I later came up with the corollary for wireless networks. Not quite as elegant as ‘Fast Good Cheap’ but every bit as valid. A given wireless system, regardless of protocol, frequency or power, had three variables: Base station radius, airlink data rate and the battery life of the terminal. The tradeoffs forced interesting choices in network and terminal (think handset) design. If you want a network that offers users a lot of bandwidth either you’re going to have to put in a lot of base stations or the users are going to be charging their handsets a lot. If you want to deploy a network with broad coverage and decent battery life in the handsets the bandwidth available to users will be low. These sorts of decisions are still made today. Software and hardware designers have been working on ways to mitigate these restraints for years. Engineers have put in power saving circuits that essentially ‘woke up’ the terminals for 1/15 of a second, every second, to see if the network had an incoming message or call for the terminal. Users never knew that their terminals were asleep most of the time, but they were ecstatic at the battery life. Didn’t you ever wonder why a simple pager could last a month on a single penlight battery? Where else have you seen similar ‘Fast Good Cheap’ choices? …is mercifully gone from the lexicon of inebriated on-course golf spectators (not to be confused with fans). But, based on what I heard while watching the spectacular US Open at Torrey Pines for the past two days, that trite belligerence has been replaced by a bellowed ‘get in the hole’ coupled with the obnoxious-to-the-point-of-distraction ‘three whistle’ after nearly every televised putt. Almost makes me wish for the rainbow-wigged proselytizer holding up his ‘John 3:16’ poster. C’mon, people. Every player wants every putt to go in. You’re hardly showing your prescience by shouting it every time a pro hits it with a flat stick. And as for the ‘three whistle’? What, you got no roller derby in your town? Really. I’ve enjoyed every visit to San Diego. You can do better. OTOH, maybe the San Diegans were just trying to set the bar for next year’s Open attendees. this page was rendered in 0.210 seconds.